Gradually, we are closing in on Dr R K Pachauri's little outpost of empire in 27 Albert Grove, Merton, as further evidence is obtained which reveals the undeclared scale of this operation. 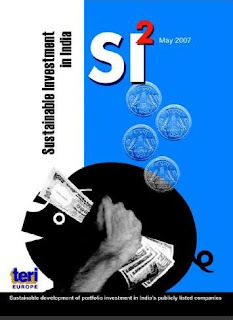 The "smoking gun" is a 50-page study entitled: SI2 - Sustainable Investment in India, reporting on "Sustainable development of portfolio investment in India's publicly listed companies," which TERI Europe published in May 2007. This was the year that the organisation filed accounts with the Charity Commission claiming an income of a paltry £9,000 and an expenditure of a mere £5,000. Although it was produced, we are told, with the "generous support" of the Global Opportunities Fund of the UK Foreign and Commonwealth Office, we still do not know how much it cost to produce. Nevertheless, we have speculated that it cost a great deal more than the £5,000 declared as expenses that year, and the "generous support" given to carry out the project must have been considerably more than the £9,000 declared as income. 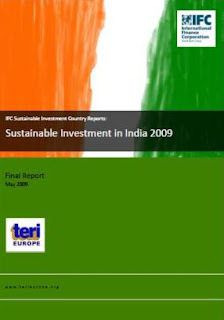 Now, however, we are in a very much better position to estimate the cost of the project as TERI Europe went on to update this report for the International Finance Corporation – an offshoot of the World Bank – which it published in May 2009 under the title "Sustainable Investment in India 2009". 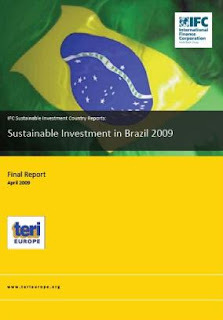 This document, with one other produced by TERI Europe in April 2009 - called "Sustainable Investment in Brazil 2009" was part of a three-part project each very similar -two parts of which were completed by TERI Europe and the third by a Chinese organisation. And here, there is information on costing, through the good offices of the IFC Advisory Services in Environmental and Social Sustainability, which has produced its Annual Report 2009, containing the details. The projects were started on 21 July 2008 and the total cost, shared between TERI Europe and the Chinese outfit, Business for Social Responsibility Advisory Services, was $331,000. Assuming an equal split between the three parts of the project, that means TERI Europe must have been paid about $110,000 for each of the reports. Even with today' debauched sterling, that still amounts to nearly £70,000 a throw - £140,000 for the two. 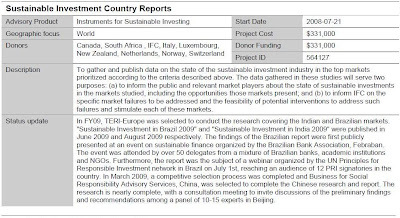 Now, we cannot say that TERI Europe was paid the same amount for the "SI2 - Sustainable Investment in India" report, although the organisation does acknowledge the "generous support" from the FCO. Given the scale of the production, it surely cannot have been much less. Thus, we have a situation where there is good evidence that TERI Europe was engaged in the production of a report for which it must have attracted funding in the order of £70,000 and incurred considerable expense, yet it shows an income of £9,000 and an expenditure of £5,000. Even if there is a substantial discount on the SI2 report, it is simply not credible that TERI Europe could have operated that year with an income so low, or spent so little. On the face of it, we are very much closer to showing that this organisation has indeed been guilty of false accounting, and misleading the Charity Commission. We have written to the FCO, formally asking for details of the amounts paid to TERI Europe for the project, and await their response with interest. We will keep you appraised, as the noose tightens.